The Witch-King of Angmar Sauron was originally a mere servant, the Lieutenant of Morgoth. After the defeat of his master at the end of the First Age, he hid himself in a dark place in Middle Earth, only to emerge 500 years later as Annatar, supposedly as an emissary of the Valar. His beautiful visage and cunning performance seduced the Elves of Eregion. They crafted the rings of power, desiring to sustain all things. Yet in secret, he secretly forged a ring through which he could dominate all the others. However, the elves deduced his plan immediately and took off the rings. Furious, Sauron unleashed the armies he had been building in the black land of Mordor, thus initiating the of War of Elves and Sauron. The slaughter was terrible, with the lands west of the Anduin being completely overrun by his hordes of orcs. Yet Gil-Galad and his elven subjects did not submit, and with the aid of a powerful Númenórean host, his forces were decimated and forced to retreat back to Mordor.From then on Sauron would be the Dark Lord of Mordor. Barad-Dur would finally be completed, it serving as the citadel from which he would direct his armies of Orcs and Trolls. The evil men to the south and east would come under his dominion as their God-King. He was at the height of his power. Ar-Pharazôn the Golden, last and strongest of the kings of Numenor, believed it was right to rule Middle Earth though. He set sail with a vast host and cornered Sauron, whose army had deserted him when faced the glory of Man. In a humiliating display, he surrendered to Ar-Pharazon, who took him as a captive. Yet Sauron managed to reverse his situation and even acheive the impossible: the corruption and destruction of Numenor.Sauron was furious when he first learned of the Kingdoms in Exile. 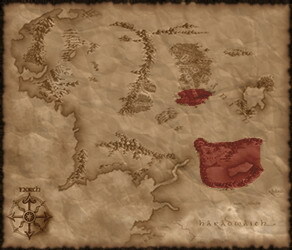 He ordered an attack upon these kingdoms, seeking to wipe out the last vestiges of Numenor. Yet his blow would prove too hasty. His armies were routed by an alliance of Elves and Men; Barad-Dur itself was besieged. There the valour of men and the shapness of a sword would prove to be his downfall. Once again he fled into the deep shadows.Yet all this is in the past. Gondor lies withered like the tree she fights for. Arnor lies dead, killed by his faithful servant while he was exiled. The Elves are a laughable remant of their former glory. The Dwarves stew in their own muck deep in the mountains. NOW is the time for the final conquest of Middle Earth. NOW is the time when Sauron will smother the Earth in shadow. For against the power of the Dark Lord of Mordor, there is no hope of victory. The Nine, a most terrible force to behold, wearing hooded black cloaks and marching upon the Free Peoples on foot. Never able to be truly defeated, they are not easily harmed by any weapon, but the harm they bring is immeasurable. They will stop at nothing to find the One Ring. Brutal close combat warriors led by Nazgul generals. The Nine, a most terrible force to behold, wearing black hooded cloaks and riding upon horses of the same evil. Never able to be truly defeated, they are not easily harmed by any weapon, but the harm they bring is immeasurable. They will stop at nothing to find the One Ring. Super-heavy shock infantry, armed with heavy maces and wearing partial plate. Brutal mounted warriors led by Nazgul generals, riding upon swift black steeds of Mordor. Can annihilate even the most solid of formations. Lightly armored spearmen with poor morale, equipped with simple spears and wooden shields. Medium armored orcs equipped with axes, curved swords, and wooden shields. Medium shock infantry, well-armed but lacking heavy armour and morale. Well trained heavy infantry, equipped with heavy mail and armed with spears and shields. Heavily armored infantry, armed with swords and iron shields. Heavy infantry armed with halberds, potent against both charging cavalry and enemy foot soldiers. Lightly armored and untrained orcs, best for scouting ahead, fast and armed lightly with crude bows. Medium armored and only equiped with bows and simple melee weapons. Heavily armored archers, equipped with long bows and short swords. Very strong trolls used primarily for siege equipment, though due to their size and strength they are formidable and fearsome opponents in battle. Strong Uruks dedicated to protecting the general. Hand-picked for loyalty and valour. Wardogs are bred for a savage nature and great size, but then hunting men is only a little more dangerous than hunting wild boar! Fields masses of orcs and powerful trolls. Sauron's stronghold of immeasurable strength. Black Gate, the main entrance into Mordor.